In his platoon’s inaugural blog post last October, the first lieutenant and platoon leader made it clear that he and every one of his soldiers joined the Army willingly. The implication, of course, is that when the going gets tough for the 25-man firing platoon, they’d have the backbone to finish the mission. But tough going doesn’t just mean combat. With the gradual drawdown of American troops in Afghanistan, fewer and fewer support services are available for service members on the ground. That, coupled with the fact that troops on small installations like Forward Operating Base Ghazni – where Lyman’s platoon lives and works – didn’t have much to choose from in the first place, can make downtime nearly as much of a grind as time spent on patrol. That’s where the USO – and specifically USO2GO – comes in. The USO2GO program delivers customized, morale-boosting packages to the most remote places on Earth. Troops deployed anywhere around the globe that don’t have a USO presence can request USO2GO shipments through the USO’s website. 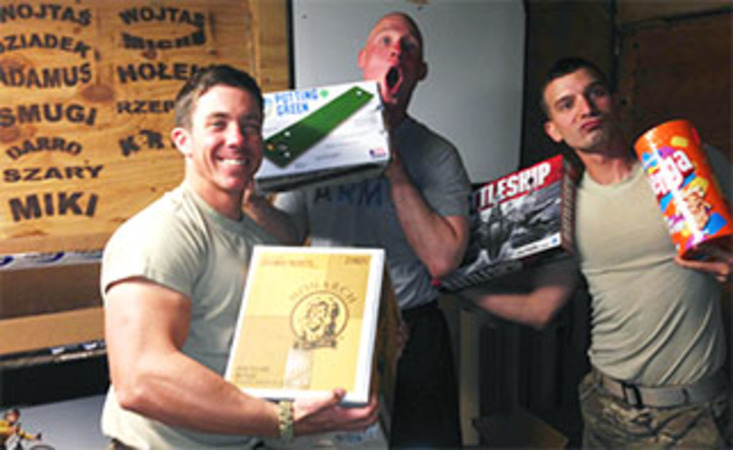 USO2GO shipments provide everything from beanbag chairs, snacks and coffee to toiletries, sports equipment, board games, televisions, DVDs and video game consoles and titles. “There isn’t an item we haven’t made use of already in the first couple of weeks,” Lyman wrote. “Whether it is the extra toiletries, the board games, sports equipment, or the Wii and the Xbox, my soldiers have already put it to good use. When a soldier in Erbil, Iraq, stopped by the USO and asked if the USO could provide his Army unit with much-needed toiletries in less than 48 hours, the USO team on the ground sprang into action and delivered for troops outside the wire.